The 2010 Chase for the Sprint Cup kicked off Sunday in New Hampshire with a wild 300-lap race that came down to fuel mileage and saw Clint Bowyer go from 12th in the standings to championship contender in one afternoon. Earning the 12th and final transfer spot in the Chase, Bowyer and his No. 33 team led by Shane Wilson put together a car that dominated the early stages of Sunday’s Sylvania 300. Falling off a bit in the middle stages of the race, Bowyer and Wilson took a gamble on fuel mileage and made it work when others could not. Saving gas throughout the final stages of the race, the No. 33 Chevrolet was able to close on the gap to leader Tony Stewart, who was also gambling on fuel mileage. Coming off the fourth turn to get the white flag, Stewart’s car ran out of gas and Bowyer took over the lead. Both cars had pitted on the same lap, but Bowyer was able to save a touch more and take the checkered flag over Denny Hamlin, Jamie McMurray, Dale Earnhardt Jr. and Kevin Harvick. For Bowyer, the risk of gambling on fuel mileage was worth the reward. 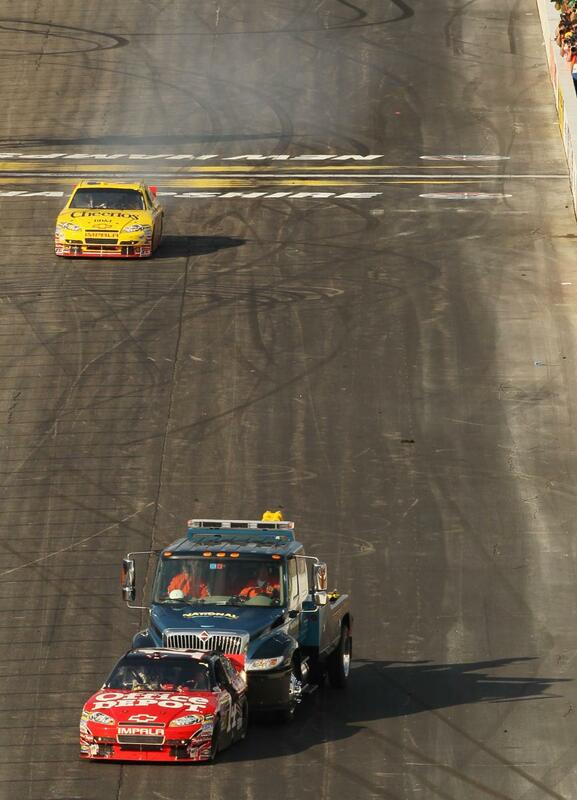 While Bowyer was celebrating with a burnout, Stewart was struggling to coast across the finish line. Leading 100 laps on the day, Stewart’s gamble did not pay off as he finished 24th and fell to 11th in the Chase standings. Bowyer dominated the early stages of the race, but a caution on Lap 208 brought the field to pit road. After service was complete, Bowyer and Stewart raced off pit road, with the No. 33 getting the slight advantage. Few would have expected this would be the final time either driver would visit pit road. Taking the green flag on Lap 209, Stewart took advantage of Bowyer’s poor restarts – thanks to a carburetor issue – and passed him on the outside. Behind the two leaders, chaos ensued. Carl Edwards, Denny Hamlin, Jeff Burton, Kurt Busch and Jeff Gordon battled hard for positions third through seventh, diving under each other and giving little room. Going into the third corner, Edwards bobbled under Hamlin, lost the car and made contact twice with Hamlin’s car. The second contact sent the No. 11 Toyota spinning as the rest of the field scurried to avoid piling in. The spin sent Hamlin back to 22nd and forced him to regroup and work his way back up to the front. 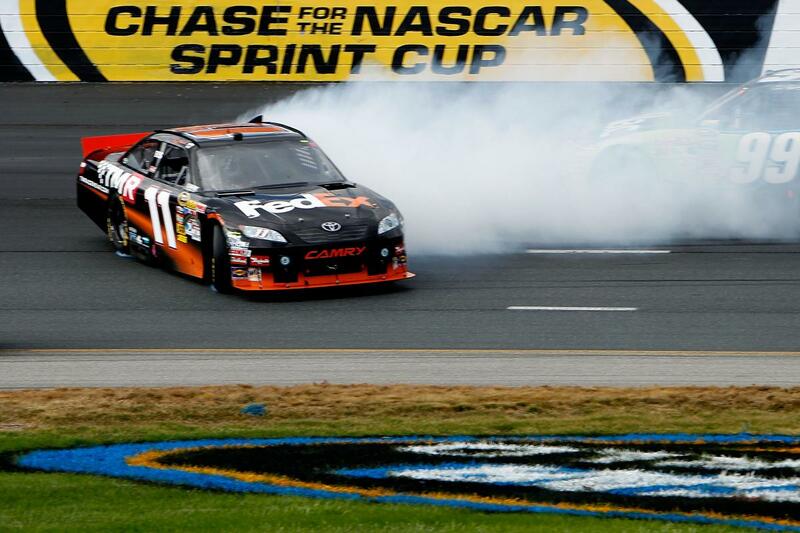 The incident also allowed Hamlin to hit pit road, giving him more fuel then front runners Stewart, Bowyer and Burton. Those “few things” that Hamlin touched on were a string of cautions that flew over the next 20 laps. With the field dicing for positions, many times going three-wide around the flat one-mile track, it did not take long for cars to get into one another. Less than five laps after restarting from Hamlin’s caution, Kurt Busch got into the corner under Jeff Burton and spun his No. 2 Dodge. As the field avoided Busch’s spinning car, Kyle Busch made contact with Jimmie Johnson, sending both of them spinning as well. Looking to get through the smoke, Kasey Kahne drove into the back bumper of Busch’s No. 18 Toyota. Under this caution, the field headed down pit road for service, but Stewart, Bowyer and Burton stayed out. Just five laps after restarting for that incident, pole sitter Brad Keselowski was put in the middle of a three-wide situation with Carl Edwards on the bottom and Matt Kenseth to his outside. Keselowski moved up the track and made contact with Kenseth, who spun backwards into the outside wall. Despite major damage, Kenseth hung on to the lead lap and finished the day 23rd. Following the restart for Kenseth’s issue, Kurt Busch found trouble again when he got loose under the No. 20 of Joey Logano, sending him hard into the outside wall. Avoiding the wreck, Jimmie Johnson got into Elliott Sadler, sending him spinning as well. The cautions allowed Stewart, Bowyer and Burton to save fuel, while it also allowed Hamlin to move back into the picture. With a fast race car and others ahead of him having trouble, Hamlin sat 10th when the race restarted with 54 laps to go. As laps clicked away and the field became strung out, the threat of cautions diminished and allowed for green flag racing to the end. With a car better on the long runs, Bowyer was able to close in on Stewart for the lead, but was constantly being reminded to save fuel. With the two leaders slowing to conserve gas, Hamlin was busy charging back to the front with no concern for his fuel mileage. With 25 laps to go, the No. 11 was consistently the fastest car on the track, running fifth, but was nearly 4.5 seconds behind Stewart, the race leader. Hamlin moved past Jeff Burton for fourth with 15 laps to go and then took third from Jamie McMurray with 10 laps to go. Sensing his chances at winning, Hamlin closed the gap over the final 10 laps which did not allow Stewart and Bowyer to back off and conserve fuel as well. “I saw the 11 coming and then you start worrying about, well, I’m not going to let him pass me,” Bowyer explained. “I said, I am go to go run out for it before the guy passes me again. Of the three drivers that pitted on Lap 208 and stayed out the remainder of the race, Burton was the first to fall by the wayside. Forced to race hard for position following his final stop, the No. 31 ran dry and dropped him to a 15th place finish. “We just came up a little short,” Burton said. “We thought we were good (on fuel). We saved on it under all the cautions and the first 3/4 of that run, I was saving too. We just didn’t get as good of fuel mileage on that last run as we had been getting. It is what it is." With Hamlin charging to the front and Bowyer closing ever so slightly, Stewart’s tank ran dry two laps too short and Bowyer was able to hang on for the win. Making his fuel last 92 laps, Bowyer leaves the first race of the Chase now second in the standings, only 35 points behind Hamlin. – Jimmie Johnson was very aggressive from the drop of the green flag for Sunday’s race in New Hampshire. Starting 25th, Johnson took his car three-wide on the first lap and never stopped racing hard from that moment on. After suffering damage in two different cautions, Johnson reported a huge vibration and hit pit road for a loose wheel with 45 laps to go. Entering the day second in the standings, Johnson’s 25th place finish dropped him to seventh headed to Dover next weekend. – Following one of the worst performances of his career, Dale Earnhardt Jr. put his dismal effort at Richmond behind him to come home fourth in Sunday’s race. Running well the entire day, Earnhardt Jr. scored only his third top-5 of the season and first not at Daytona. The fourth place finish was not without its hurdles, however. Early in the race the jack stop broke on pit road and then on another stop, Junior was blocked in by Regan Smith. Despite these setbacks, Earnhardt was able to overcome and finish up front. Is A Teammate An Advantage In The Chase? A Favorite Heading Into The Chase? 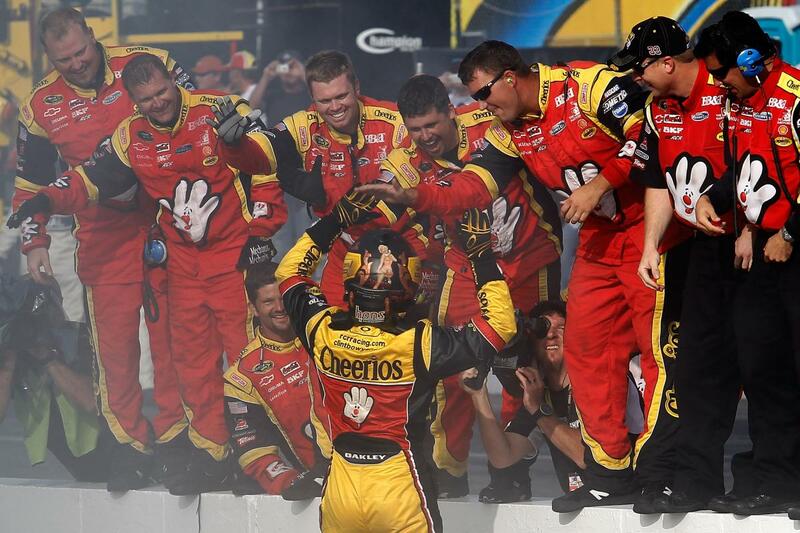 Do Bonus Points Matter In The Chase?